Understand your health and take action to improve with Fitbit Charge 3 – an advanced health and fitness tracker that uses 24/7 heart rate and personalised insights to reveal what's below the surface. In a chic grey shade, this unisex design is perfect for any person, any outfit, any day. With a battery life of upto 7 days, this advanced tracker technology keeps a 24 hour, 7 days a week tracking of your heart rate; offering goal-based exercises to improve your health; keeps track of your sleep; and is swimproof too, allowing you to keep check of your body during all forms of exercise. With smartphone notifications too, this smartwatch has everything covered. With personalised insights, the Fitbit Charge 3 helps to determine which workouts are best suited to you. 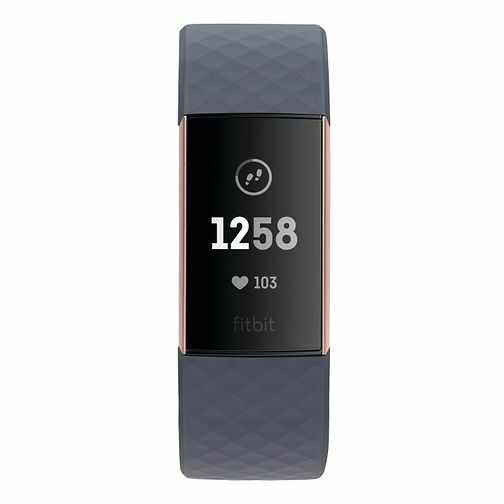 Fitbit Charge 3 Grey Strap Fitness Tracker is rated 5.0 out of 5 by 2. Rated 5 out of 5 by Anonymous from Great Tracker Good upgrade from Charge 2. Waterproof and touch screen are improvements worth having. Rated 5 out of 5 by Anonymous from Very pleased with both Fitbit and earrings Great buy, bought this for my daughter for her birthday and she is really pleased with it.